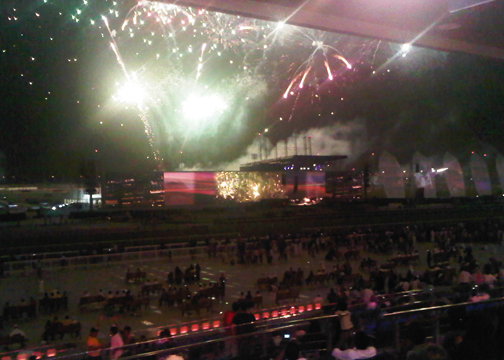 The richest horse race in the world with a purse of USD $10 million, the Dubai World Cup, was held in the brand new Meydan grandstand this year. 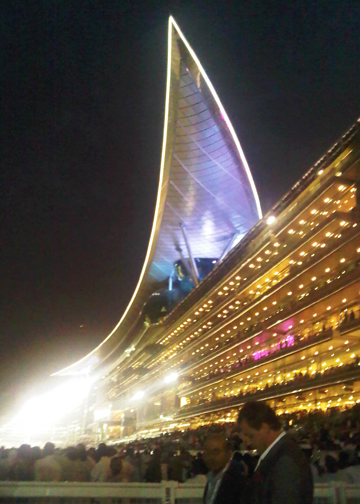 Meydan is the longest building in the world, stretching 1.6 kilometers; the grandstand can seat 60,000 people and also includes the world’s longest LED screen. Of course, in Dubai, could it have been any other way? While I think there is definitely something to be said for having some restraint and modesty, Meydan pulls off its grandeur very well. Impressive though the building was, very futuristic and chic in design, I was far more interested in finally getting the chance to don a fabulously absurd feather fascinator and cute cocktail dress. Basically, I thought a day at the races was excellent fun. A bit hot perhaps, it would be nice if the DWC could be held a month earlier, as by the time you get to late March the outrageously hot weather is starting to come back in full force (the high that day was 106*F/41*C). That said, most of the event takes place after the sun has begun to set and goes into the night, at which point the weather is really very lovely. 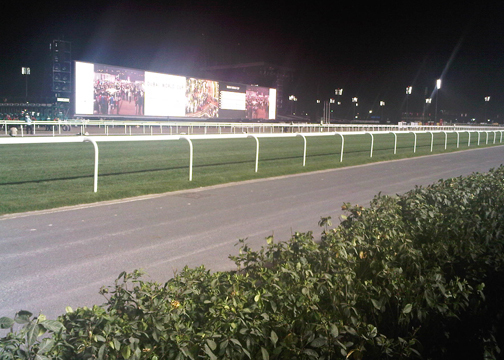 There were 8 races in total, with the Dubai World Cup taking place last. The winner was Brazil’s Gloria de Campeao. It was all quite a spectacle, between the women dressed to the nines, the fireworks displays and of course the races, all of which was topped off with an Elton John and Santana concert. Sadly, I couldn’t make it to the very end (and probably for the better, the taxi queues at the close of the event must have been unbelievable) and left a few songs into Elton John’s performance, without seeing any of Santana. Not too bothered about that though, while I like Elton quite a lot, I haven’t got an opinion on Santana either way. It ends up, running around in sky-high stiletto platforms for a good 10 hours in the heat with some champagne and wine is really quite exhausting! 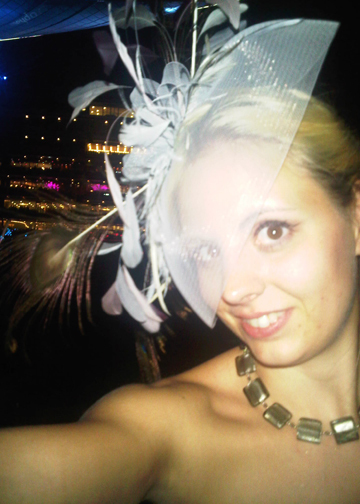 So, very much looking forward to the Dubai World Cup 2011 (and choosing the new outfit, I’m thinking floor-length dress and pheasant feathers next year). I completely loved my first horse racing event and it’s definitely not going to be my last! Next stop will be more low-key – Nepal to trek the Himalayan Annapurnas in May!